Large, heavy and oversized pieces of artwork make beautiful, unique and bold statements in your home. After investing a large amount of time and money in these pieces, the next step is safely hanging and anchoring your artwork to display it in your home. – A hammer: Use a full-size hammer for maximum driving power. – A tape measure: A sturdy tape measure that will not bend or jam during measuring will do the trick. – A level: Any old-fashioned level will work; don’t worry about going high-tech. – A pencil: Choose a pencil with easy-to-erase lead to remove any marks made while measuring. These items are all readily available at any local hardware supply or home improvement store. Next, you will need some specialized hanging materials that are designed to bear heavier loads. – Painting hooks: The kind of hooks you need depends on the size of your artwork, but you can find these at most hardware and home improvement stores. – Hangers: Purchase sturdy hangers, like strap hangers, to ensure your painting stays where you need it to. – Picture wire: Grab some heavy coated wire that will stand the test of time. Depending on the composition of your wall, where you’d like to hang the artwork, and how sturdy you need your hanging materials, you may also need additional tools, such as drywall or mortar/concrete anchors or plywood bracing for extra support. Now that you have your tools, hanging your artwork is a straightforward four-step process. Create a safe, efficient workspace by clearing the areas in front of and below the wall where you plan to hang your artwork. Consider removing anything already on the wall as well to eliminate the chance of any damage to previous artwork, shelves or anything else that may already be hanging nearby that might shift while you’re working. As mentioned, if your wall is anything but drywall, such as plaster, block or wood construction, you may need screws or anchors and specialized hangers to safely hang your painting. Though each installation project is individual and different based on the design of your room, the aesthetic you want to achieve, where you’re hanging your art, and how heavy the piece is, start by centering your artwork on your wall. This gives you a good starting point from which you can adjust and refine your placement later. If you want to get technical, check out this online painting height calculator from Xanadu Painting Gallery to figure out exactly where to hang your painting. Once you’ve settled on the right location, you can drive in your mounting hooks or hangers. The ideal – especially for heavier items – is to use anchors that drive into studs in your room. Another tip: If your item is extremely heavy, consider using multiple hooks to help spread out the weight distribution on the wall. Double-check your wire, hooks, hangers and other tools by picking up the painting by the wire. If you feel any give or hear any creaking, replace your mounting hardware. It’s always better to exercise extra caution now than to experience regret later. – Wear gloves to protect your new artwork from fingerprints and smudges, and put down padding to rest your artwork on as you take measurements. – Consider asking a friend or professional to help you hang your painting to avoid injury (especially in the case of extremely heavy items). – Make sure the wire is on the hook before you let the artwork hang on its own. With a bit of measuring and patience, getting your artwork sturdily mounted and displayed is a snap. Still not comfortable doing it yourself? 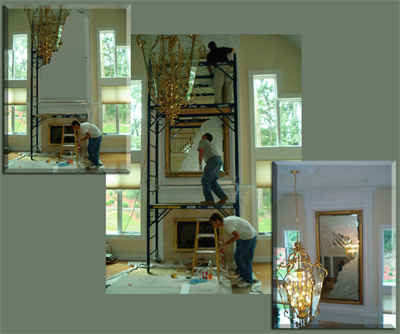 At L.A. Frame, we can also take care of delivery and installation services for any artwork, mirror or other custom-framed work at your home. Contact us today and find out more about how we can help Frame the Art of Your Life.